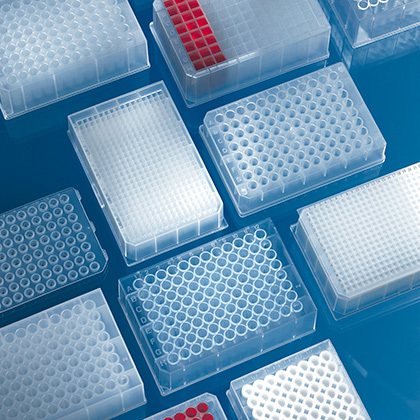 Product and ordering information for Polypropylene & Deep well microplates: Excellent for sample storage, high throughput screening (HTS), etc. ; PP for chemical resistance or PS for clarity; compatible with most robotic samplers and automated liquid handling systems. NEW! 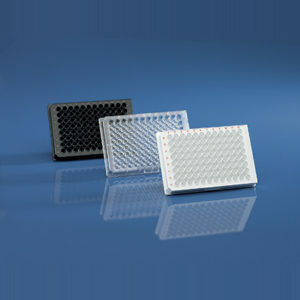 96-well V-Bottom plates available non-sterile or sterile. BRAND Deep-Well plates are excellent for sample storage, high throughput screening (HTS) assays requiring a motherplate, cell and tissue culture, immunological assays, and other applications. Plates have 96- or 384-wells and are available in volumes of 0.3mL, 0.5mL, 1.1mL, and 2.2mL. 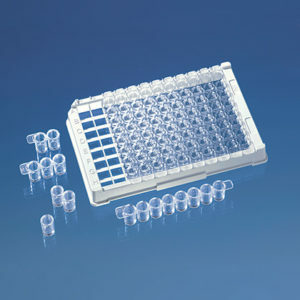 Wells are labeled in a standard alpha-numeric pattern to simplify sample identification, and are stackable for easy storage. Notched corners facilitate orientation in robotic samplers and automated liquid-handling systems. 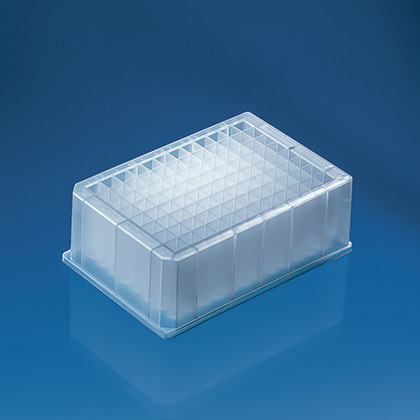 The non-sterile polypropylene (PP) plates, manufactured from high-quality virgin propylene, are autoclavable and resistant to a wide variety of chemicals, including phenols, chloroform, and DMS. In addition, the PP plates can withstand temperatures as low as -80°C/-112°F, making them excellent for cold-room applications and cryo-storage. Choose the polystyrene plates for clarity or surface properties. BRAND 96-well and 384-well plates may be used with flexible mat covers or adhesive sealing films to reduce sample evaporation and contamination. Are the Deep-well plates autoclavable? Deep-well plates made of PP are autoclavable (121°C , 2 bar, acc. DIN EN 285). Note: The 1.1 ml Deep-well plate (Cat. No. 701352) is made of PS and is not autoclavable. How can the Deep-well plates be sealed? BrandTech offers cover mats for the Deep-well plates, as well as a variety of self-adhesive sealing films. Are the cover mats for the Deep-well plates autoclavable? While mats made of polypropylene (Cat. No. 701358) or modified polyethylene (Cat. No. 701360) are autoclavable, mats made of EVA (Cat. No. 701362) are not. Mats made of silicone (Cat. No. 701357) are only autoclavable at 101°C for 20min. 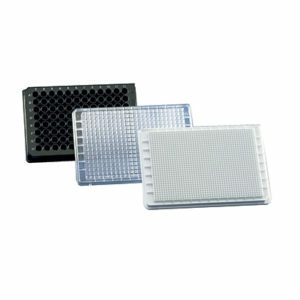 Cover Mats - Improve sealing and reduce evaporation of samples. Sealing Films - Self-adhesive for secure sealing. Available in a variety of materials for different applications.